In Little League World Series action last night, Venezuela defeated the Dominican Republic 3-2 on a two-run, walk-off triple by Omar Romero. A thrilling moment for the Venezuelans, but a crushing loss for Dominican pitcher Edward Uceta, who’d been nearly unhittable during the tournament. 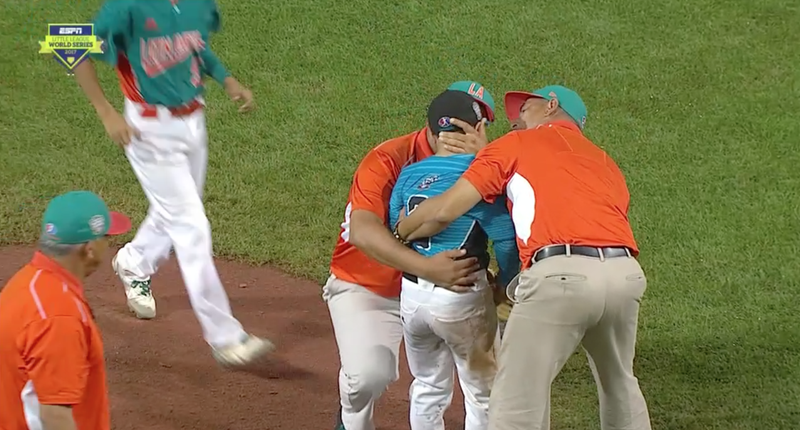 Uceta collapsed sobbing on the mound, and he was almost immediately rushed to and consoled by Venezuelan coaches and players. It’s enough to make you feel good about humanity for a hot second. Uceta received hugs from the victorious Venezuelans in the handshake line, and afterward both managers made the cliched—if entirely accurate—observation that this is bigger than baseball. “We’re all Latino, we’re brothers,” Dominican Republic manager Jose Cordero said of Venezuela’s sportsmanship. Something about the Little League World Series always manages to sand down my cynicism. It’s crammed with sweet moments. The Venezuelans get right back at it this afternoon, with an elimination game against Mexico.